Full arch implants are becoming more common today due to recent advancements in dental implant treatment. The all on 4 dental implant solution was pioneered and extensively researched and tested by Dr Paulo Malo of Malo Clinic in combination with Nobel Biocare of Sweden. The all on 4 dental implant treatment basically refers to the placement of 4 dental implants strategically placed in a single arch in order to replace a full arch of missing teeth. The protocol avoids complex bone grafting procedures in the upper and lower jaws. 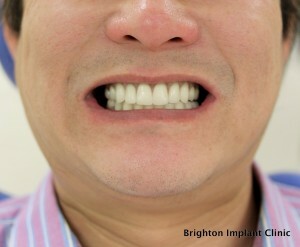 Full arch implants to replace missing teeth. The all on 4 protocol involves placing implants at a 45 degree angle in order to avoid the maxillary sinuses on the upper jaw and the inferior dental nerve in the lower jaw. The two anterior implants are placed according to the anatomy of the jaw bone. 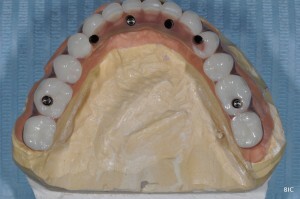 The four implants work together in order to support a fixed bridge. 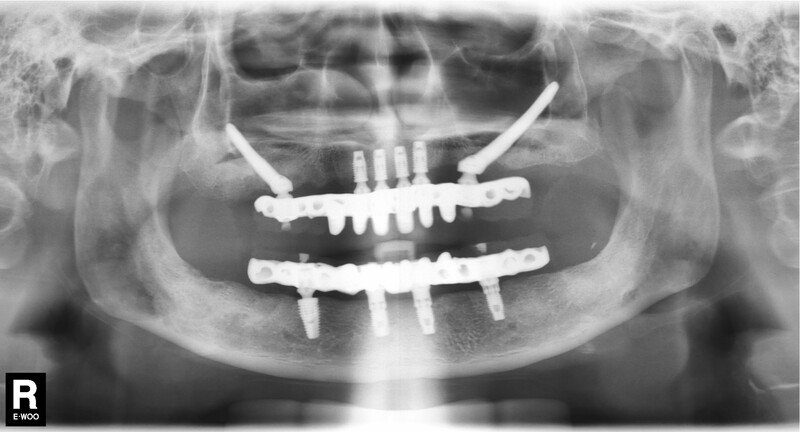 The implants are designed in a specific way in order to create maximum anchorage when placed into the jaw bone. One of the main advantages of the all on 4 treatment is that it is possible to have the implants placed and fixed teeth loaded onto the implants on the same day of surgery. 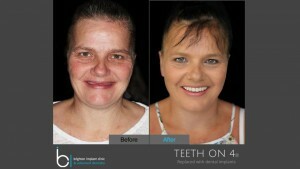 Unlike traditional implant placement techniques which require long healing times and wearing removable dentures during this time, with the all on 4 treatment the dental implants are able to support fixed teeth on the same day of surgery. So what is "All on 6" implant treatment? Basically in some cases where patients have very good amounts of bone, it is not necessary to place angled implants in order to avoid the anatomical structures mentioned above. This means that the implants can be placed in a conventional means, basically vertically as there is sufficient space and bone for the implants. In such cases the surgeon can place 6 implants in order to provide more support and stability to the fixed bridge. The dental implants can also extend more posteriorly to provide more support for the molar teeth. The all on 6 protocol basically allows patients to have full arch implants placed and fixed teeth completed in just one day. 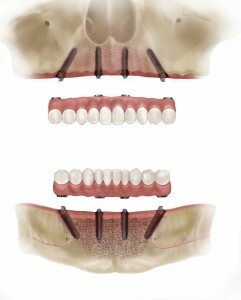 The fixed bridge which is fitted after surgery is a provisional hybrid bridge. 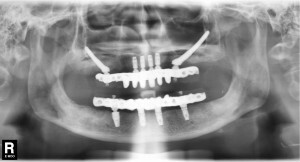 This provisional bridge is usually used for up to 6 months while the implants heal and fuse with the jaw bone. Once it has been confirmed that the implants have all osseo-integrated then the final hybrid bridge can be completed. In cases where 6 implants are placed it is possible to make a provisional and definitive hybrid bridge with fourteen teeth. 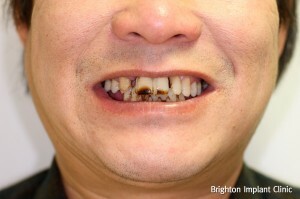 Whilst this may seem advantageous to some patients it does come with limitations as to a higher risk of tooth fracture. The more posterior teeth have to deal with higher forces and more compressive stresses during function hence are more likely to fracture. Teeth on the provisional and definitive bridges are repairable usually within a few hours at a dental implant laboratory. 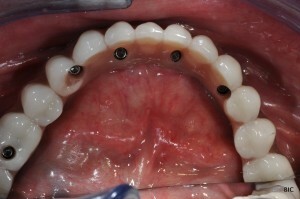 Whilst the implants are integrating the patient uses the provisional bridge. It is very common that changes need to be made when designing the definitive bridge. 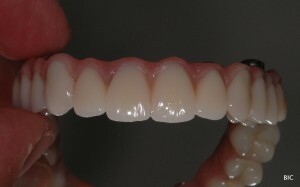 The patient may want to change the colour, shape or position of the final bridge or alter the amount of lip support. This stage is very important to achieve the ideal aesthetic appearance of the teeth to look and feel just like natural teeth. Together with the dental technician the implant dentist can create the perfect smile you have always wanted. Question - How much do full arch implants cost? Extractions of problem teeth, in some cases where multiple teeth are extracted this may be charged separately. Provisional dentures that are needed during the extraction healing phase will also be charged separately. Implant placement, the number of implants can vary between four to six implants, however if more implants are used the cost will not be higher. Provisional bridge on the same day of surgery. Our clinic has an on site dental laboratory and all of our patients have their provisional bridge made on the same day. Final non precious metal bar with passive seating titanium bases bridge and acrylic after 6 months. Accomodation if required on the day of surgery at local hotel 5 minutes walk from the clinic. The cost of treatment will be higher if zygomatic implants are needed during the dental implant treatment. Question - What is zygomatic arch implants? Answer - Although the 'all on 4' implant solution is suitable for many cases, it not always possible to provide this treatment to those patients which have very limited amounts of bone. In these instances different types of implants could be used in order to overcome the limitations of jaw bone shrinkage. Zygomatic implants are more complex types of dental implant treatment and are usually carried out by very highly experienced surgeons. 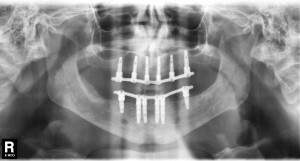 Question - What is the full mouth bridge on all on 4 implants made of? Answer - There are two distinct bridges during the all on 4 treatment. The provisional bridge (made on the day of surgery) is made of acrylic only. The bridge is known as a hybrid bridge as it consists of both pink portions or artificial gum tissue as well as teeth. The size, colour and shape of teeth can vary from one patient to another. The definitive bridge is made with a non precious alloy bar for rigidity with passive seating titanium bases and acrylic or composite teeth. Brighton Implant Clinic provides affordable full arch implants treatment in their four branches of implant clinics. Each branch has an onsite CT scanner in order to accurately plan implant treatment. Dr B Silva is one of the surgeons at the clinic and has experience in full arch implants.